ANN TAYLOR LOFT NWT L Blue 100% Cotton Loose Knit Open Style Cardigan Sweater. Solid navy blue color. Color may vary slighlty from the picture. White shirt shown in photos is not included. 100% Cotton. DETAILS: This is an Ann Taylor Loft beige cardigan 100% silk. It has crewneck and ¾ sleeves. MATERIAL : 100% Silk. COLOUR : Beige. The close up pictures generally are the most accurate color. Therefore. Beautiful sweater. Button down. Front pockets. 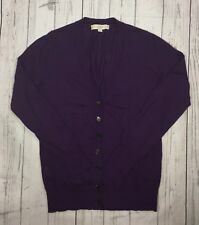 Women's Ann Taylor Loft Wool Blend Purple Cardigan Sweater-Size M chest 18" across front length 25 1/4" Few small snags on back of one sleeve. Not really noticeable. ANN TAYLOR LOFT. CARDIGAN SWEATER. LONG SLEEVES. GRAY BASE & LIGHT BROWN EDGES. 4 POCKET with BUTTONS. BUTTON SLEEVE EDGES. LOFT by Ann Taylor Cardigan. Two front pockets. Machine wash cold, gentle cycle. Fabric Content Button front. 3/4 length sleeves. Length 21". White Beaded Neckline Detail. Round Buttoned Neckline. Ribbed Bottom and Sleeve Edge. Very Good Condition. Washed and Sanitized. 3/4 Sleeves. Ribbing at hem of body and sleeves. Two pockets on front. %100 cotton. From Ann Taylor LOFT Sz S. NWOT. Wool infused, ribbed trim borders this conveniently pocketed knit for extra allure. Front slit pockets. 41% Viscose, 33% Nylon, 26% Wool. Net Weight: 1.1 lbs. Machine Wash Cold. Drop shoulders. Open front. Dark Brown. Ribbed Bottom, Neckline and Sleeve Edges. 3/4 Sleeve. Bottom: 26". Washed and Sanitized. See Photos. Top of shoulder seam to edge of cuff: 18". Length in back: 22". Armpit to Armpit: 20 1/2"" x2. Designer: Ann Taylor Loft. Style: Cardigan. Chest/Bust (armpit to armpit): 19. Length (collar to hem): 22. Sleeve Length (shoulder to hem): 16. Material: Cotton. Shoulders (seam to seam): 14. Crew neckline, ribbed hem and bottom of sleeves, eight blue front buttons. Original secure buttons, no stains, snags, holes, loose stitching, fading, stretching or piling. Length: 22". Sleeves: 18" long. Color: Navy Blue. Material: 100% Cotton. Lining: none. Care: Machine wash cold. Hot pink fuchsia. approx 25 length. Ann Taylor Loft. Button Down Cardigan Sweater. Large Aqua Blue Color Buttons. 100% Cotton. Dolman Sleeve. Ann Taylor LOFT Black Cardigan Sweater Small S. - Ann Taylor LOFT. - Cardigan Sweater. - Sleeve Length: 27". - Open Front. Designer: Ann Taylor Loft. Style: Cardigan. Length (collar to hem): 26. Chest/Bust (armpit to armpit): 19. Sleeve Length (shoulder to hem): 18. Material: Feels like Cotton Blend. Shoulders (seam to seam): 14. • Closure: _____________Pullover. • Product Type: _________Sweater. • Material Type: ____ 38% Viscose, 21% Nylon, 19% Modal, 12% Wool, 10% Angora. • Color: ____________Red. Total Length – 25”. • Style Type: ____________Casual. Cardigan sweater. 55% Cotton, 25% Rayon, 15% Nylon, 5% Silk. Sleeve Length: 12". Shoulders: 16". Length: 24". Waist: 30". Button front. Designer: Ann Taylor Loft. Style: Cardigan. Sleeve Length (shoulder to hem): 23. Waist (6 in under bust): 38. Shoulders (seam to seam): 17. Chest/Bust (armpit to armpit): 21. Material: Cotton Blend. Length (collar to hem): 24. Ann Taylor LOFT. Ann Taylor. Designer/Label - Ann Taylor LOFT. Style - Cardigan Sweater. We have a large selection of clothing, shoes, belts and handbags. With over 2000 of the most desirable labels in our inventory, you’re bound to find lots of rare and hard to find pieces as well as common necessities. Details-Soft cotton blend. Cardigan/Cape with batwings. Zip up front. Two black pockets in front. Hook eye closure. Length - 20". I tem:Cardigan Sweater. Length from the back neckline to bottom hem : Cardigan 24 in. Underarm to underarm (laying flat, pit to pit): Cardigan 28 in. Sleeves: Long Sleeve. Color:Off White. 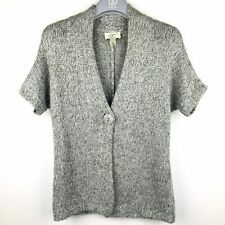 Great cardigan by Ann Taylor LOFT Petites. Top quality and very comfortable, dress it up or down. A wonderful piece to add to your wardrobe. In excellent condition. Pictures have been taken with and without the flash. Armpit to armpit:21". We want you to get an item that you can be satisfied with. Gorgeous Eggplant Purple Waffle Knit High Collar LS Sweater Jacket by Ann Taylor LOFT Petites. LENGTH- 24". 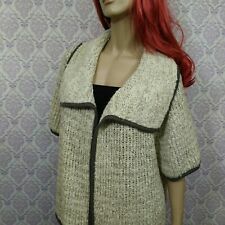 Lovely gray knit wool blend side-zip cardigan sweater by Ann Taylor loft. • Nice knit sweater with side zip and zippered pockets. • 50% acrylic 50% wool. Length 22.5". Sleeve 3/4". Pit to pit 16.5". From Neck to Hem it is 25". from under arm to hem it is 15 1/2"". from armpit to center on both sides is 11". Sleeves are 20" L. Good pre-owned condition. Care Instructions: Machine Wash, Tumble Dry. Color: Beige. Condition Notes:Gently used. Length: 27 in. Materials: Cotton Blend. Designer: Ann Taylor Loft. Style: Cardigan. Length (collar to hem): 22. Chest/Bust (armpit to armpit): 18. Shoulders (seam to seam): 15. Sleeve Length (shoulder to hem): 20.